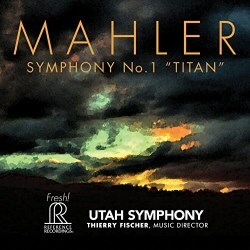 Strictly speaking it’s incorrect to refer to Mahler’s First Symphony as the Titan, as that title was only appended to the first few performances of the piece. Still, it makes for a snappy hashtag on Twitter, such as RR’s TitanTuesday. Levity aside, this new recording ought to be a very interesting one, not least because the Utah Symphony are no strangers to Mahler. Collectors of a certain age will remember their pioneering Vanguard set with Maurice Abravanel, recorded between 1963 and 1974; it has been reissued on CD, most recently by Musical Concepts (review). The Swiss conductor Thierry Fischer was part of the UK music scene between 2006 and 2011, when he was principal conductor of the BBC National Orchestra of Wales; this position is now held by the very promising Thomas Sondergård. Fischer, appointed music director of the Utah Symphony in 2009, doesn’t have a track record when it comes to Mahler; the composer doesn’t feature in Fischer’s small discography and I don’t recall hearing him tackle any of the symphonies while he was at the BBCNOW. That may put him at a disadvantage with this recorded First, as the catalogue is already stuffed with fine performances of the piece. The double centenary of 2010-2011 swelled the flood of both new and reissued Mahler recordings. How very different it was forty to fifty years ago, when that Abravanel set was made. The First seems to have fared particularly well on disc; among the more recommendable versions I’ve heard in recent years are David Zinman’s with the Zurich Tonhalle Orchestra (review) and Klaus Tennstedt’s live LPO account on BBC Legends (review). The latter may be 25 years old, but I’d say it’s one of the most complete and compelling Mahler Firsts on record. For various reasons Jonathan Nott (Tudor), Markus Stenz (Oehms) and Lorin Maazel (Signum) all failed to impress me with their Firsts. So how do Fischer and his Utah band stack up against the competition? The wonderfully bucolic start to the first movement is clear-eyed, and those woodwind calls are very well caught by the RR team. That’s the good news; the bad is that Fischer’s reading is rather lightweight, with little or none of the echt-Romantische atmosphere that the music demands. It’s not just about outward things, it’s about the inward ones – or, rather, the lack of them. Take any of the classic Firsts – Walter, Bernstein, Levine and Tennstedt spring to mind – and one senses a profound connection there, an intuitive understanding of the Mahlerian idiom, that you simply won’t find with Fischer. Indeed, Fischer seems to busk his way through the score, and that means its nodal points and ear-pricking epiphanies count for very little. I do like the general clarity of this performance though, helped as it is by a reasonably forensic recording; that does highlight some of the music’s delightful timbres, especially in the second movement. However, Fischer shapes Mahler’s infectious rhythms in a way that suggests efficiency rather than affection. Perhaps that’s a fair description of this performance as a whole; it’s workmanlike rather than wondrous. I suspect that has been semaphored to the orchestra, who respond more in duty than with daring. I’m also irked by Fischer’s wayward tempi and his seeming inability to build tension or a decent dramatic arch. Sonically I’m not terribly impressed either; in SACD stereo at least the soundstage seems rather narrow and the frequency extremes aren’t as well defined as I’d like. When RR do get it right – as they did in Organ Polychrome – the results are exceptional. Their recordings of Manfred Honeck’s Bruckner Fourth (review) and the Saint-Saëns from Kansas (review) aren’t in the same league but at least they’re more engaging than this dull newcomer. The third movement’s macabre cortège is a perfect example of Mahler’s fascination with the odd and off the wall; the music, darkly poetic, brims with lovely detail, little of which is heard in this prosaic performance. Here, more than anywhere else, I yearned for more light and shade, for at least some feeling for the music’s abiding strangeness. The fourth movement fares little better; indeed, there’s no sense of a strong narrative, of an approaching apotheosis. Admittedly Fischer and his players regroup for a storming sign-off, but that doesn’t begin to atone for earlier sins. The audiences are very well behaved and there's no applause. Performances such as this are proof that the endless fascination with Mahler has its downside. Too many concert programmers and record labels see this music as a dead cert, but in a field packed with champions most entrants will end up as also-rans. And that’s precisely what’s happened here. Thierry Fischer’s Mahler First underwhelms at every turn; even the sound falls below the label’s best.